LAS VEGAS, NV (January 6, 2010) - Panasonic today introduces a new entry-level digital camera, the LUMIX DMC-F3, which has been designed with simplicity in mind, without overlooking the importance of style and performance. 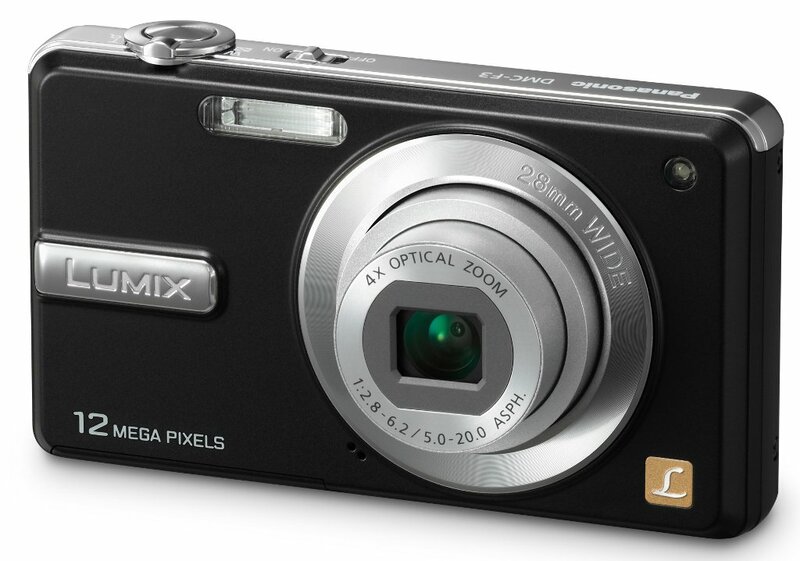 The 12.1-Megapixel LUMIX DMC-F3 has an impressive 4x optical zoom, considering its small size, as well as Panasonic's shooting-assistant, Auto Scene Mode. The LUMIX F3 also records dynamic High Definition video in 1280 x 720p, at a smooth 30 fps, in addition to WVGA (848 x 480) and normal VGA (640 x 480). The LUMIX F3 is equipped with a 28mm wide-angle lens, a high-sensitivity CCD, and an Extra Optical Zoom function which extends zoom power to 7.8x, plus a 2.7" 230,000-dot resolution LCD designed so the user can clearly see it while shooting still photos and videos. "The Panasonic LUMIX F3 was designed for the casual and frequent user who wants a digital camera that is not only small and stylish in design, but that has sophisticated features to help enrich the photo-taking experience," said David Briganti, Senior Product Manager, Imaging, Panasonic Consumer Electronic Company. "With extended zoom and Auto Scene Mode, the Panasonic LUMIX F3 can take high-quality photos and videos, while still being easy-to-use and small enough to fit in your pocket." Intelligent ISO Control prevents the blurring of a moving subject by optimizing shutter speed and ISO settings to render sharp, clear images. On the LUMIX F3, unwanted red-eyes are digitally corrected and backlight compensation automatically activates. Face Detection helps to clearly capture registered faces and focus on faces with the appropriate exposure. This is helpful when trying to focus on one person within a group. Intelligent Scene Selector automatically selects one of six scene modes that best suits the shooting situation - Macro, Portrait, Scenery, Night Portrait, Night Scenery. Additionally, the Panasonic LUMIX F3 also has a Digital Image Stabilizer which helps suppress hand-shake and prevent blurry photos. The Panasonic LUMIX F3 has an auto power LCD function which detects light conditions and automatically boosts the LCD backlighting by a maximum of 40% when shooting outdoors to secure clarity and visibility of the screen. In addition to supporting conventional SD/SDHC Memory Cards, the LUMIX F3 is compatible with SDXC Memory Cards, including Panasonic's newly announced 48 GB* and 64 GB SDXC Memory Cards - to enable high capacity content storage and fast data transfer speeds. The LUMIX F3 is compatible with Windows 7**. Pricing and availability for the Panasonic LUMIX DMC-F3 will be announced 30 days prior to shipping date. The Panasonic LUMIX F3 will come in silver and black models. For more information on these LUMIX models, please visit: www.panasonic.com/ces2010. *GB = 1,073,741,824 bytes. Usable capacity will be less. ** Windows and the Windows logo are trademarks of the Microsoft group of companies.